Scattered. Just look at his studio. See his portfolio. His projects are varied. 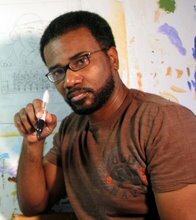 He’s created art for picture books, wallpaper, fabric, greeting cards, light switches, digital scrapbooking materials, and the MY PEEPZ characters (calendars). Don describes himself as a man under constant revision. “God ain’t through with me yet,” he says. Most recently, he crossed over from the illustration side of the book business to author his first picture book, IT JES’ HAPPENED: WHEN BILL TRAYLOR TAUGHT HIMSELF TO DRAW. It will publish with Lee & Low Books in the fall of 2010. The aesthetic technician. It’s not at all fair that the visual work falls to Don simply because he’s an illustrator. But it’s a role he’s embraced with a passion. The idea for the poster was his sole creation. The Brown Bookshelf logo, all him. Don’s attention to artistic detail is what breathes life into our mission, reminding both us and our visitors that it’s close to magic when words and pictures work together. What You Don’t Know About Don . . . He was inspired at an early age by his Aunt Eleanora E. Tate, who was a reporter for the Iowa Bystander, a Features writer for the Des Moines Register, and later a novelist. From her he learned that he could be anything he wanted to be. He was also inspired by the character J.J Evans from the television show Good Times. On the show, J.J was an artist, who later went on to work as an art director for an advertising agency (the actual paintings on the show were those of artist Ernie Barnes). 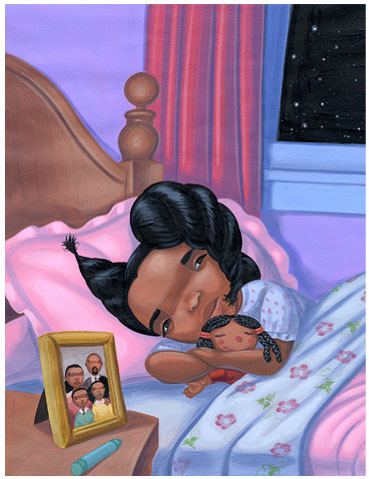 Grandma’s Teddy, written by his wife, Tamera Diggs-Tate, was one of the first books he illustrated. It’s the story of a little girl in search of the perfect gift for her grandmother, which turns out to be a kinte cloth teddy bear. The book was sold along with an actual kinte cloth bear, and was published by Identity Toys, an African American toy company (no longer in existence). He is a Scout leader for his son’s wolf den. His beard would be mostly white if it weren’t for the magic of Men’s Clairol. 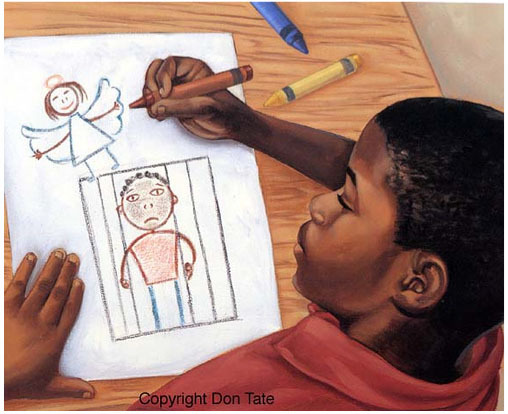 (first sample) Marcus draws a guardian angel for his dad who is in prison, from the book THE LEGEND OF THE VALENTINE. (second) “Dreaming your dream of beautiful black, black all around.” From the book BLACK ALL AROUND! 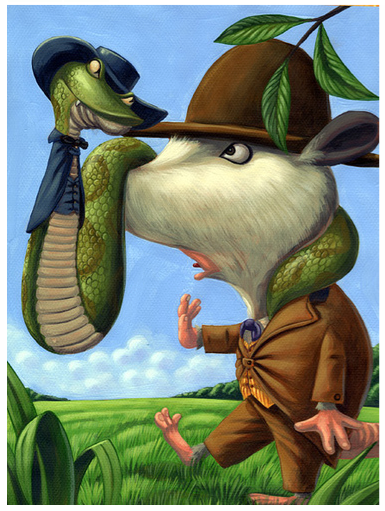 (third) Bruh Snake and Bruh Oppossum from the book SURE AS SUNRISE: STORIES OF BRUH RABBIT AND HIS WALKIN’ TALKIN’ FRIENDS. 🙂 Even without the details on Clairol and such, Don Tate’s personality and humor shows through his work — detail and movement and emotion. Good stuff. Great feature. Love the samples of Don’s artwork. So cool that he was inspired by his Aunt Eleanora and JJ from Good Times. Thanks, Don, for your talent, sensitivity and hard work. We’re blessed to have you in our team. This is great! It’s so good to learn more about you. 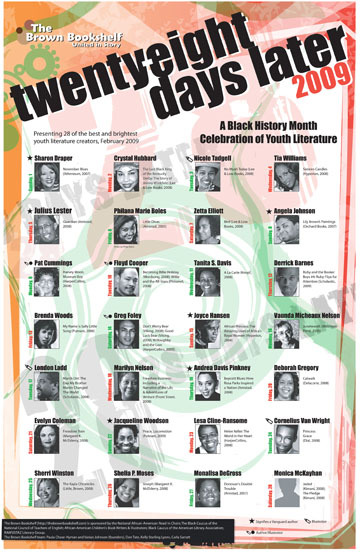 A few years ago, I was at an African American cultural museum in Baltimore and saw this nice calendar with Black cartoon characters who looked like teenagers. I purchased it for my daughter, who was about eleven at the time. It was the first time I’d seen anything like it targeting young folks. Just so happens it was Don’s work. I love his art and the fact that we would cross paths as BBS members is more proof of this serendipitous thing we have going on here. I awarded this blog the Your Blog is Fabulous Award. (Hop over to my blog to see it.) What you do for promoting AA children’s/YA fiction is unmatched. Thanks for posting! Its always nice to learn more about the artist. I especially like the image of the father and son reading together. Congrats Don! Nice to learn more about you, Don! your work sure is varied! I’d love to have such flexibility. Looking forward to more books by you! don, you’ve got it down. Don is a great person to work with and his talent is amazing. I am amazed my artists period since I can only draw stick figures and houses. Thanks for sharing…I enjoy getting to know you more.